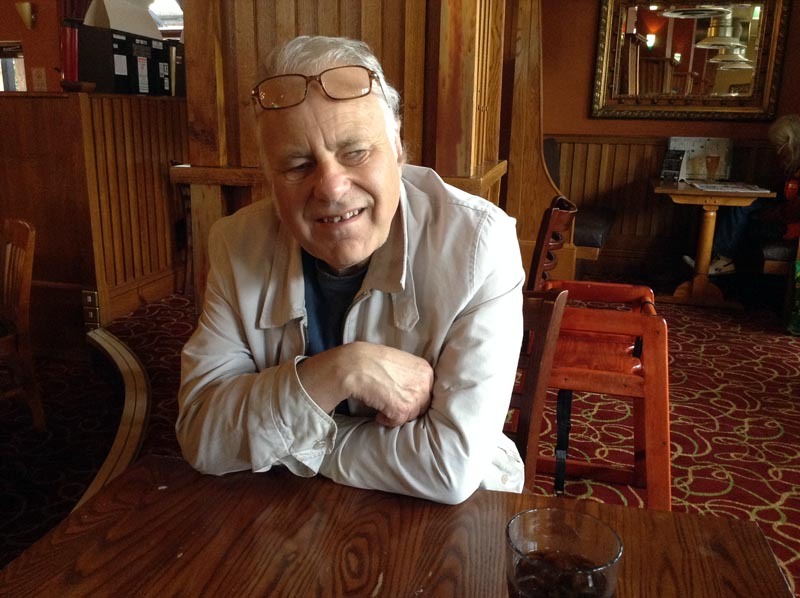 Early this morning my good friend and fellow Fortean, Peter Rogerson, peacefully passed away in an hospital in Manchester. I can not express how big a loss this is. Peter was a man full of knowledge and full of life. He did know that he would not be around much longer since he was diagnosed with a cancer that doctor’s said they were not able to treat but we had plans to meet one last time on March 21st when he planned to give AFU the very last of his fantastic Fortean book collection – a collection I and friends from AFU have been bringing to Sweden during the last five years or so. But the sickness took him from his house, the very house he lived in for his whole life, and his beloved books to a hospital. He never stopped hoping to get back one last time. I did know of Peter and his work through his writings for Magonia, the wonderful magazine edited by my friend John Rimmer in London, now a web magazine, but it was many years later that I through John realized that Peter was a man that had a fortune of knowledge and books in his two story house on Braddon Avenue in Urmston in the outskirts of Manchester. As I was always looking for books and paper to save for AFU (Archives for the unexplained) I called Peter from a pub in the South of England. My goal was to have a first meeting with this man who I only knew was an avid reader, prolific writer and lover of books. Our first conversation is something that I will never forget. After presenting myself I asked Peter if it was possible to see him later the same day. He politely answered that it was not easily done since he was working late at the library. I countered with that this was not a problem since we were rather far away (300 kilometers) and would arrive late. Peter, reluctant to meet with us, said that it would be a problem to find a parking place near his house at that time of day on which I said that we could very well park some blocks away and walk. Peter then told me that he had not cleaned his house and it was a terrible mess – I said that we were very well prepared for such things and did not have any nicer clothes, on the contrary. Peter tried another approach and said that he did not have any chairs or anything else to sit on – I answered that we could stand and talk which would be good for us after driving for more than three hours. Peter, who knew that we were interested in his books, made a last try to keep us away and said bluntly that his books were planed to go to the local library and not to anyone else – I said fine, let’s just talk. At that point Peter gave in and a couple of hours later we met in Urmston. And everything Peter had told us was perfectly true. And we found a house filled with books in double rows, bookcases everywhere and boxes with magazines and more books on the floor. And one chair not crammed with books in front of Peter’s computer. And that first meeting was the start of a wonderful friendship. After that meeting we met many times, talked, had lunches at some local restaurant of Peter’s choice. And looked at books, packed and carried to our car. Every time Peter sent parts of his vast Fortean book collection back to Sweden and AFU with us. 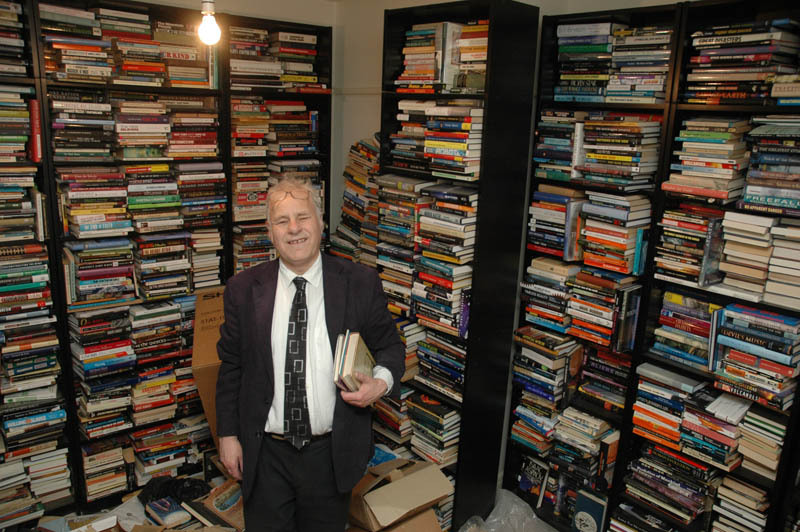 Many thousand of books which makes Peter together with Hilary Evans AFU’s largest donator. By far. 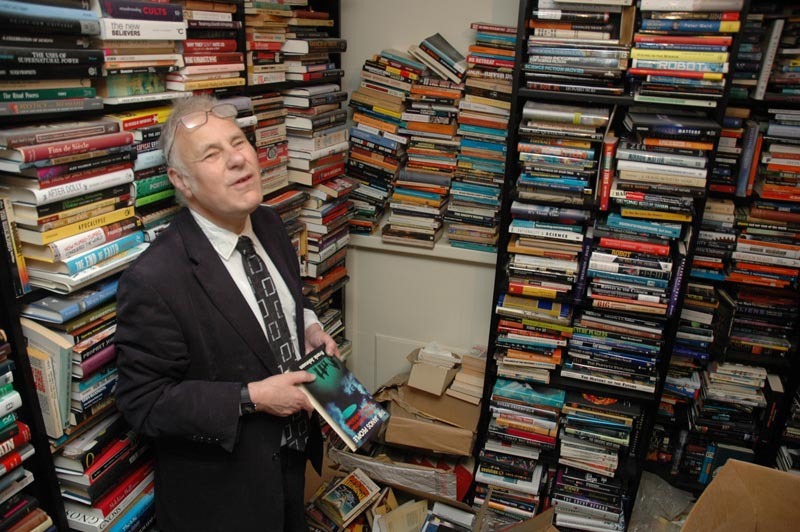 Peter spent his whole working life as a librarian in the public service and, as his friend John Rimmer writes to me: ”His contribution to our fields of interest was incalculable. Other people will not know very much about his other interests – folklore, folksong, local history, and politics.” He lived for his books and was seen through his writings. Peter was not a public person but very much a person who made ufology . better place. An eye problem made some people prejudge Peter, thinking less of him. But his mind was brilliant and his thoughts always carefully translated into text, often as book reviews. Everyone who had the chance to meet with this wonderful man would know that as well. 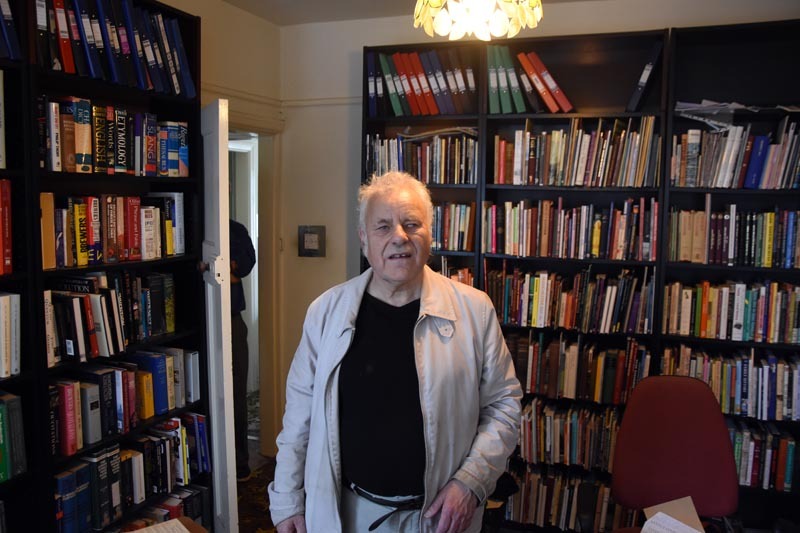 His fantastic book collection included books about UFOs, Bigfoot and other strange creatures, ghosts in many shapes, strange happenings, ancient astronauts, folklore from all over the world, conspiracy theories, astronomy, evolution, science in general and many other topics. may the Good Lord protect us. if you can, O Lord protect us. Now Peter is sailing to Magonia. He is deeply missed by us still left here. Peter was born 1 July 1951 and got to be only 67 years. The funeral will take place on March 26th at Warrington Crematorium. You can read more about Peter in a blog post by his long time friend John Rimmer. Dagen började alltså med det tråkiga beskedet att Peter Rogerson har gått bort. Så jag satte mig och skrev ovanstående, lade upp det på Facebook och mejlade ut detta till de som jag vet kände honom. Sedan har jag försökt att göra det jag hade tänkt – fortsätta förbereda Mellofinalen. Men också att laga lunch till mig och Markus som vi åt framför det obligatoriska avsnittet med ”Simpson’s”. På vägen till jobbet ringde jag min tidigare arbetskamrat Jackie Bortz i Luleå som fyller år i dag. Men Jackie befann sig i Madrid visade det sig. Vi pratade en stund och allt var bara bra med honom och Lisa som också var med på resan. På jobbet stod mötet mellan statsminister Stefan Löfven och president Donald Trump i fokus och där fick jag direktrapportera och sedan när presskonferensen var över snabbskriva en artikel. Gjorde åtskilligt annat också men det var detta som flest personer intresserade sig för och långt över 2.000 följde min rapportering. Mat fick jag inta i min ensamhet på La Barca i form av Husets pasta. Proppmätt. Och eftersom det var vår sista kväll med Pontus, som nu övergår till dagtid igen, så hade jag, Åke och Erik samlat in till lite finfika i form av var sin mindre påse tortillachips och en flaska alkoholfri cider som jag plockade upp på Mat pressen och Bolaget. Trist att Pontus försvinner igen. Alltid kul att jobba med honom. Hemma vid 01.30 med en av mina favoritchaufförer som dessutom gav mig en flaska risbrännvin från Sydkorea som han fått av någon. Peter in his house on 4th May 2010. Peter in a pub 22nd september 2014. Peter in his house on 18th September 2016. Detta inlägg postades i Allmänt, Forteana den 06 mars 2018 av Clas Svahn.